NOT AN EXIT proposes a closer examination of the everyday locations that we routinely pass through. 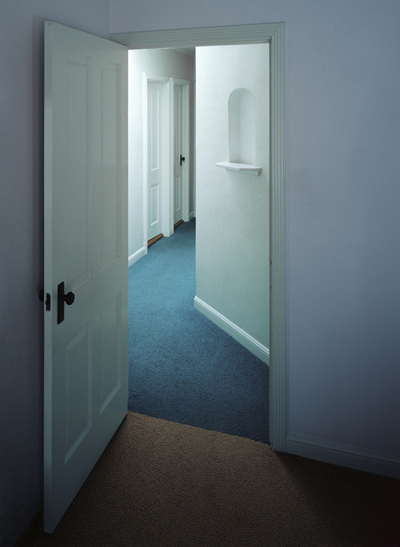 The subjects of the series are doorways and hallways, liminal spaces intended for movement that somehow appear impenetrable. Maze-like optical illusions occur when the linear elements align to simultaneously flatten and expand the two dimensional plane. Void of cultural signifiers, belonging to no specific place or location, a universality of line and form reoccurs from image to image, offering a deeper assessment of the formal elements that make up the spaces we pass through and sometimes never truly see. We are going somewhere and yet—there seems to be no way out. Born and raised in New York City, Austin Irving is an artist who graduated with a BFA from the Department of Photography and Imaging at TISCH School Of The Arts at New York University. Her work has been exhibited in galleries and museums in California, New York, Ohio, Washington, Illinois, Virginia and New Mexico. Her photographs have been featured in The LA Times, Art Ltd., Slate Magazine, The International Herald Tribune, Artillery, Wired, Architectural Digest, and LOOK3 Festival of the Photograph. Irving currently lives and works in Los Angeles and her work is represented by Wilding Cran Gallery.